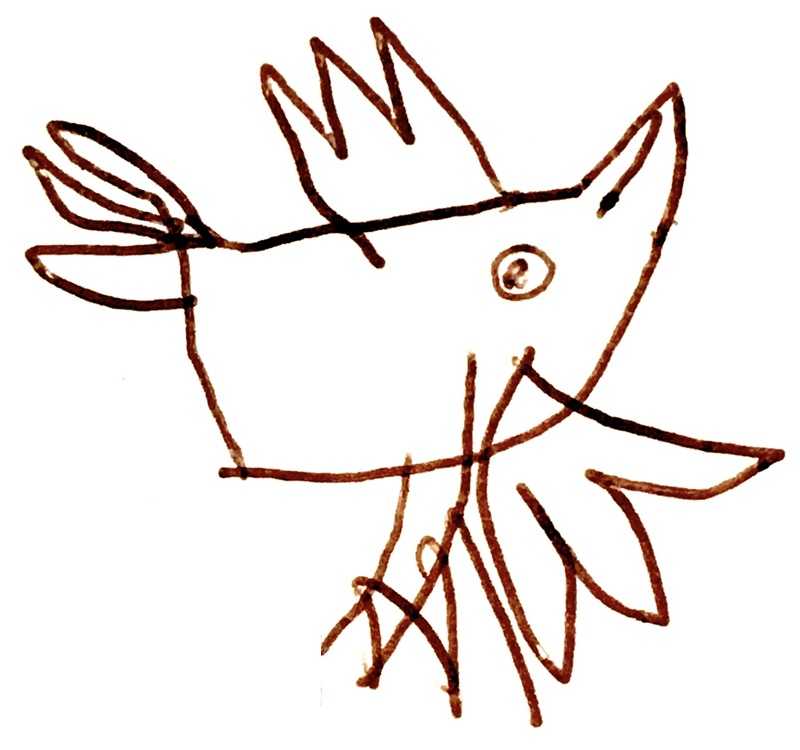 The Wonder Journal – How do birds fly? Have you ever wondered about birds? How do birds fly? Have you ever sat somewhere very quietly and watched birds. Have you often wondered ‘How do birds fly?’ for a while and discovered how clever they are? There are so many wonderful things they do every day which many people never even notice because they don’t take time to stop and look and wonder. Take flight, for example. Everyone knows that birds can fly but have they ever wondered how do birds fly? Or have you ever wondered what it would be like if you could fly? Not in a plane like people do, but free as a bird, using only your own wings? I have. Wouldn’t it be wonderful to soar above the trees, houses and the oceans to get a bird’s eye view? As I write this I am sitting by a window with a view of a beach and I can see a large flock of gulls circling round, gliding on the air currents, swooping down every now and then to land on the sand or to dip into the water. Have you ever stopped to consider what a wonderful thing flight is, and how easy birds make it look? And yet it definitely isn’t easy at all for us! Why is that? There are stories of many people down through the ages who have longed to fly and have tried many different methods. Have you heard of Daedalus who used feathers and wax to make wings so he and his son, Icarus, could escape from the cruel King Minas who held them captive? Or the inventor, Leonardo da Vinci, who lived 600 years ago and yet designed a flying machine very similar to our modern day helicopter?! There are others too. Some were real characters from history and others we hear of in myths but each of them show us how, throughout the past, men and women, boys and girls have always imagined what it would be like if they could learn the secret of flight. It might surprise you if I told you that, although birds are born with bodies which are formed for flight, they still need to actually learn to fly. Their teachers are their parents and they first begin to learn by watching what they do and copying them. 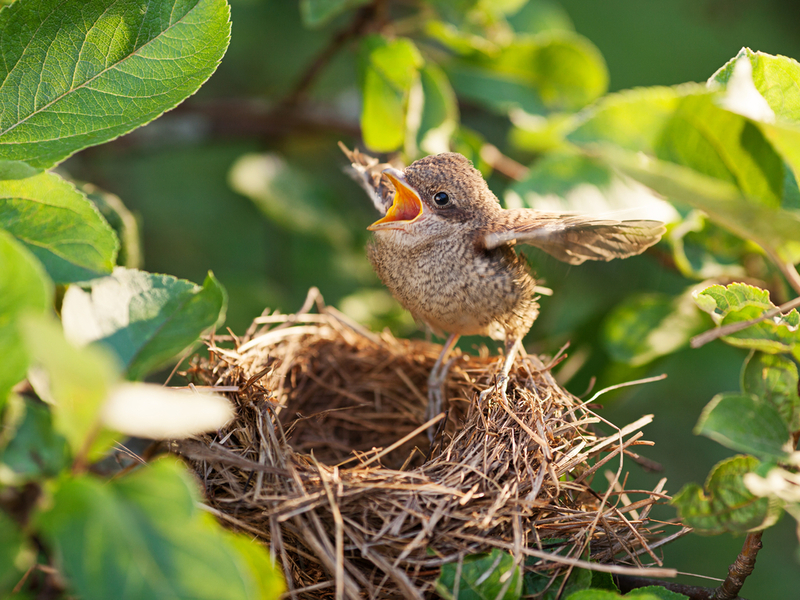 Many wild birds are born without feathers so they must wait for them to grow before they can even try to fly. As they get stronger and their plumage develops (and if you watch carefully) you might notice them sitting up in their nest, exercising their wings before the big day comes when they take off for the first time, flapping with all their might until they reach the next tree or branch or place to land. Sometimes they might look as though they aren’t going to make it and they just manage to have another burst to get them there safely. After this first flight they may be tired and need a rest or even some food from their parents to regain their energy. Other times they might actually fall to the ground rather ungracefully! Isn’t that wonderful? When I first read it I couldn’t believe how clever birds really are! But how do birds fly? But have you ever wondered how flying actually works? Why is it that a bird can run or jump, giving a few flaps of the wings and take off, when we could never do such a thing? What is it about birds that means they can fly and we can’t? Well, if you look closely at a bird’s body, you will find their bodies are particularly suited to being in the air a lot of the time, just like the anatomy of fishes is suited to being underwater People like you and me have found ways of being in both those places but they are not our natural habitat so we can’t spend a long time under water or in the air without some kind of help. The first thing you notice if you look at a bird in flight is how the shape of it’s body helps it to move quickly and smoothly through the air. It has a point at either end (it’s beak and tail) and an overall shape which gently curves up over it’s body and back down to it’s tail. If you compare this special aerodynamic shape with a human body, what do you notice? So this is an obvious difference which you can see on the outside but if you were to look inside a bird’s body what do you think you would find? Well, just as we have muscles which help us move our arms and legs, birds do too. However, birds have some very, very large muscles over their breast bone which are needed to power the movement of their wings up and down over and over again. If you were to try and squeeze a cushion up the front of your jumper, this would give you an idea of how big your chest muscles would need to be in order to have enough strength to get a body as large as your off the ground! Now I need to ask you a question: How long do you think you could run or flap your arms for before you got so tired you needed to stop? Now imagine how long birds need to fly for on a long journey. Remember that some of them migrate to foreign countries and so have to fly over whole stretches of sea without stopping. I think I might get a little out of breath if I were them! Now you would think that birds might need big lungs to help them breath easily in flight. However, rather than having extra large lungs, they have holes in their bones called air sacs which allow more air to flow freely through their bodies which means they don’t run out of oxygen whilst flying. Bird bones are also thought to be comparatively stronger than human bones in order to withstand the extra pressure put on them during flight. But you must have noticed the most obvious thing I have left out so far. What is the one thing all birds have which no other creatures do? 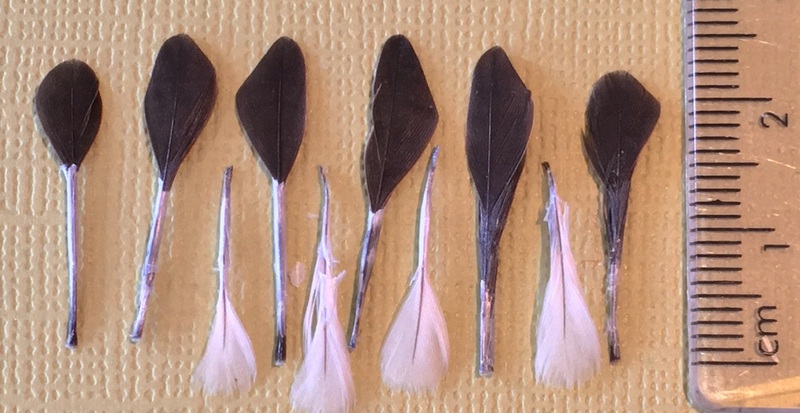 Did you know there are many different types of feathers and each type have their own special job to do in the body of the bird? If you have some feathers at home, why not get them out now and have a careful look. If you have a microscope or magnifying glass, try looking through that to see what you can observe close up. So, now you have your feathers, lay them out on a surface and compare them. 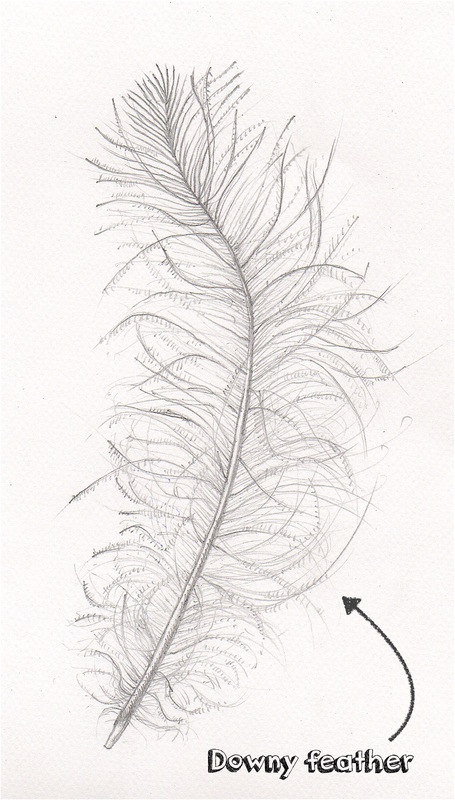 There are 3 main types of feathers which all have different jobs to do. Look at these three pictures and then compare them to your own feathers. Which do you think they are? Downy feathers are found closest to the bird’s skin. They are soft and fluffy (with no quill) and act like a thick vest or a wooly jumper to keep the bird warm. 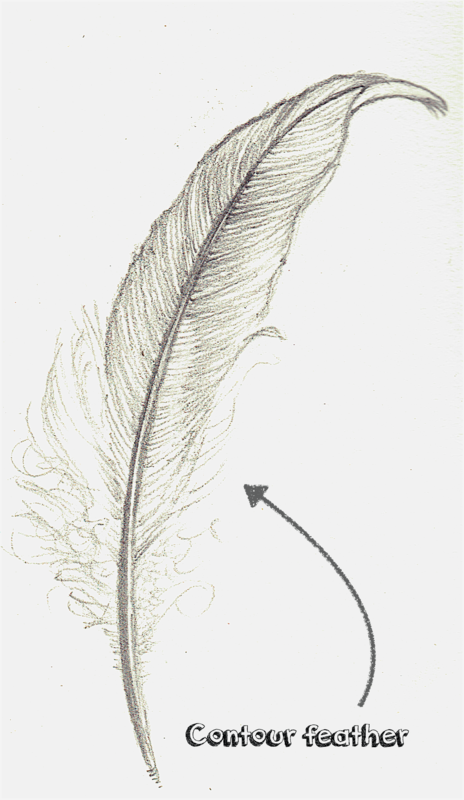 Contour feathers (or body feathers) have some fluff at the bottom of the quill but are smoother further up. They form a waterproof layer over the top of the down feathers a bit like a rain coat to keep their underclothes dry. 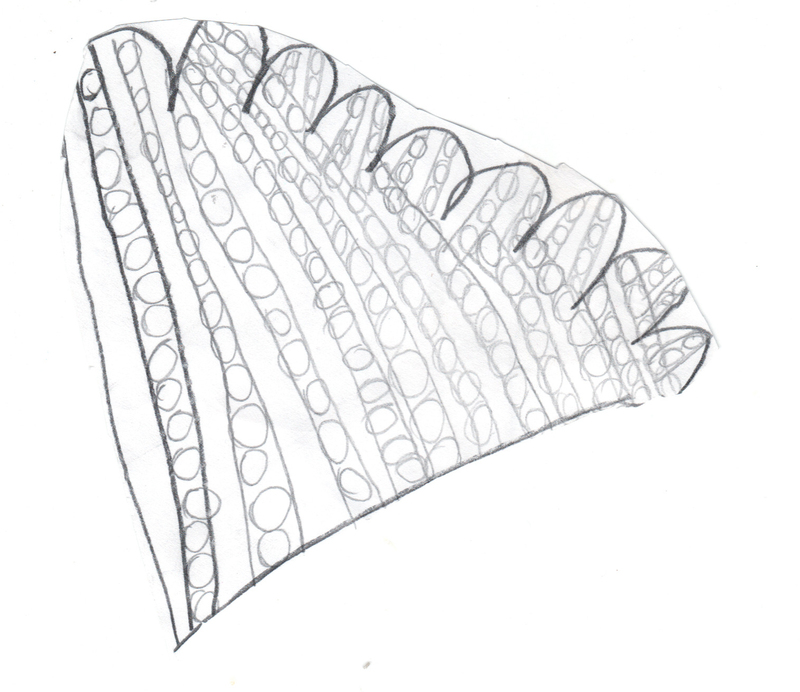 Flight feathers are found on the wings and tail. They can be symmetrical or asymmetrical. Without these a bird cannot fly properly, which means if they are moulting they have to stay at home! Flight feathers are arranged very carefully on a bird’s body so that when a wing moves in or out, the top feathers glide smoothly over those underneath. Also, the way the air flows through and around the feathers helps to create what we call “lift” which is essential if they want to get off the ground! Isn’t it wonderful to think how many different jobs feathers can do to go some way to answer that question of how do birds fly? So now I hope you can see why birds find flying so easy I hope that reading this has helped you to wonder more at the beauty and cleverness of birds. I hope you have also been inspired to take some time every now and then to stop and watch them carefully – getting to know birds like this can bring us such joy! An extract of this post appears in the Summer issue*1 of The Smart Happy Project magazine.Bringing numbers and nature together for educators and parents.